They do look rather cute and cuddly. One website fondly describes them as "sleek, soft-furred animals with big, bright, bulging black eyes." And in another place and time (like maybe a long time ago in another galaxy far, far away), one might think they'd make good pets. But in this place in time, they are magnificent pests. They multiply like, well, rats, move in everywhere you don't want them, and you just can't get rid of them. The packrat lives in your barns and cars, under your porches and your house, in your house if he can find a way in it. They steal things for their nests and they chew through wiring in your cars. They live in between hay bales and they use them for toilets. If they were toilet trainable, they might be acceptable creatures, but they are not and they are not. Not for nothing are they called packrats. A nest in the barn contains (from what I can get a glimpse of through a crack in the wall) the yellow trail marking ribbons (not the red ones or blue ones, and not the skinny ones, but the double wide yellow ones), a razor. Probably pieces of a broken coffee mug which I know one of them broke. Connie lost her cell phone one day. I thought I heard it beeping around the bus once. A few days later John later opened the battery drawer, found a packrat nest stuffed in there and reached in to clean it out - and scooped out Connie's cell phone. No word yet on any suspicious charges on the bill. One redeeming feature - if you can call it that - of the packrat, is their "midden", a debris and waste pile. Packrat urine is viscous, and once the sugars crystalize, the remaining fluid, known as amberat, eventually hardens and cements the material together. This can preserve the materials in the midden for tens of thousands of years. Scientists carbon date middens and analyze them to determine what vegetation was growing at the time they were created, and with this information, climate change over thousands of years can be determined. The unredeeming feature of the midden is it stinks and it's nasty and it can grow to be huge. Other than that, and the bit of cuteness, when they're living under your roofs, they have no other redeeming qualities. 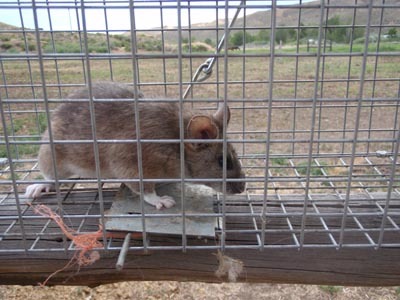 It's been a particularly good year for packrats around here in Owyhee - good if you're a packrat, not so much if you're the humans they've moved in with. They aren't that easy to trap. To catch a packrat, you gotta be smarter than the packrat. For a while there, I was. The particular colored trail ribbons and the cell phone made me think of how they love treasures, and how putting peanut butter in the trap didn't always attract a packrat before the mice ate the bait. And so, I created treasures for the packrats. What sensible packrat could bypass a hanging golden nut (as in nut and bolt), a hanging red shiny fat Christmas ribbon, or a hanging aluminum foil handmade mobile? I caught 5 packrats in the barn without bait and just these treasures hanging in the trap! And when I caught one, I just couldn't kill it. The cuteness got to me just a little... those round ears, inquisitive eyes, softness, fluffy tail. Some were scared and I felt a little sorry for them; some were so tame I could poke my finger in the cage and pet them. Sigh. I couldn't drown them, I couldn't give them to the dogs. I took them far far away and turned them loose out in the world (WHERE THEY DARN WELL BELONG! ), to either start a new life or feed the golden eagles and hawks and owls. The hanging treasures no longer work consistently for catching them - - I think they're onto me and they probably found their own special treasures lying around - and still they multiply. A packrat living outside under the house porch about drove John mad with his eluding capture for months. A gun was even fired in the dead of night once... and the packrat lived to wreak more havoc. I think he finally got trapped, but I'm sure he left plenty of family members behind. I think the key to catching packrats is to change things up a bit. 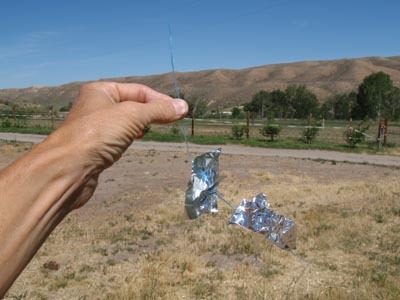 Switch from using peanut butter for bait, to hanging treasures in the trap. Put the trap in different places. You'll know their main paths - look for the most packrat poo. I've also started to mark with spray paint the ones I've caught and turned loose; who's to say they aren't intelligent with a highly honed homing compass in their heads (like horses usually have). If I ever catch a spray painted packrat in the trap - then they're goners. Really - they are cute, but really, they are pestiferous - and they gotta go. I wonder if the Ravens could be trained to hunt them? 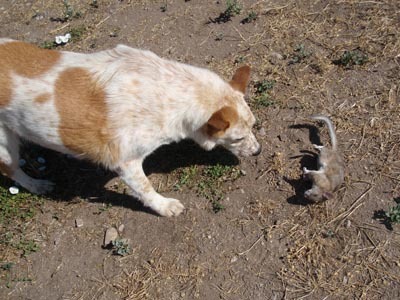 We've had our run-ins with packus rattus - they don't give up easily though terrier-type dogs do make life miserable for them. Nice idea about the spray paint! But if they are like the lab rats I worked with, the paint will be gone in a few days - rats are fastidious groomers. A more permanent method is ear notching - not too painful but permanent.